Put “open into action” – apply for inclusion in the DOAJ this Open Access Week! African research is sometimes not well documented, not visible, and sometimes not accessible enough. We would very much like to help in getting South African and African open access journals adhering to the requirements for listing, registered in the Directory of Open Access Journals (DOAJ). All SciELO SA journals already adhere to the basic requirements, and to assist you, we have compiled recommended responses to the questions on the DOAJ application form. You are most welcome to copy and paste from here, where applicable. Also – if the journal does not adhere to all the criteria, it is not the end. Where possible, I have indicated the most important criteria with a * No long answers are required, and it can be completed in less than an hour. The primary/home web address for your journal, e.g. http://journals.assaf.org.za/per. All open access online journals have web addresses. A previous title or abbreviated title or translation, e.g. Potchefstroomse Elektroniese Regsblad. If none, leave open. If your journal was/is still published in print, provide the print ISSN, e.g. 1021-447X. If you don’t know the ISSN, please contact ASSAf or the National Library of SA. Also display somewhere on your web page if any. E.g. 2413-3051. All journals online available should have a unique ISSN for the online version, separate from the print version. If you don’t know the ISSN, please contact ASSAf or the National Library of SA. Also display somewhere on your web page. The name of the institution/society/department publishing the journal, e.g. North-West University. Faculty of Law or Energy Research Centre. The name of the institution/society/department owning the journal, e.g. North-West University. Faculty of Law or Energy Research Centre. It can be identical to the publisher. How is your journal published in the online environment? Is it done using a simple web page, or software such as OJS? If the journal is only available via SciELO, the answer is SciELO. Name and surname of the journal editor at this point in time. Email address for the editor. Retype the email address in 10. In other words, do you require authors to pay a certain amount once their articles have been approved for publication? If not, say so, and explicitly state it on the journal specific web page. Enter the web address where information can be found on APCs charged. Also mention on this page if no APCs apply. Mention fees per article, and not per page. If per page, mention how many pages the average article consists of. The amount per article charged, which the author/s has/have to pay once the article is approved for publication. In other words, do you require authors to pay a certain amount when submitting an article, even before being peer-reviewed, and before being approved for publication? If not, say so, and explicitly state it on the journal specific web page. Enter the web address where information can be found on ASCs charged. Also mention on this page if no ASCs apply. Mention fees per article, and not per page. If per page, mention how many pages the average article consists of. The amount per article charged, which the author/s has/have to pay when submitting an article for possible publication. Count the number of articles published in 2015, and type the number. Does the journal have a waiver policy (for developing country authors etc)? A waiver policy excludes authors from paying Article Processing/Submission Charges, if they cannot afford it, but still have a worthy article they think should be published. Indicate what the journal specific policy is in this regard, and state whether it is allowed or not. Type the web address that contains information on the journal specific waiver policy. What digital archiving policy does the journal use? SciELO SA journals are digitally preserved using Portico. This journal utilizes the Portico system to create permanent archives of the journal for purposes of preservation and restoration. Click here to view [journal title] in the Portico Keeper’s Registry. Does the journal allow software/spiders to automatically crawl the journal content (also known as text mining)? Yes – all SciELO SA journals are accessible by Google. Which article identifiers does the journal use? All SciELO SA journals are required to use DOIs. Does the journal provide, or intend to provide, article level metadata to DOAJ? This is for the journal to decide. Optional. Does the journal provide article download statistics? 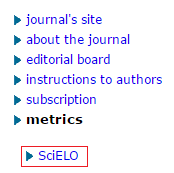 Yes – each SciELO SA journal has an option to view usage statistics. Find the following page for your journal, and copy and paste the link to the DOAJ application form. This is the year in which the issues were published, e.g. 1960 if articles that were digitized and made online available. Does the journal have a policy of screening for plagiarism? Whether the journal screen for plagiarism or not – please indicate on the journal page. E.g. 8-12 weeks from the date the article was submitted, peer-reviewed, edited, and published. [Journal title] is an Open Access journal which means that all content is freely available without charge to the user or his/her institution. Users are allowed to read, download, copy, distribute, print, search, or link to the full texts of the articles, or use them for any other lawful purpose, without asking prior permission from the publisher or the author. This is in accordance with the BOAI definition of Open Access. “Yes” for all SciELO SA journals. With which deposit policy directory does the journal have a registered deposit policy? In an Open Access environment it is recommended that the authors retain the copyright, and not sign away copyright to the journal. In an Open Access environment it is recommended that the authors retain the publishing rights, and not sign away publishing rights to the journal. Please let me know should you have any questions regarding the above, and we can gladly assist! Also remember to indicate on your journal web page once the journal has been approved for inclusion in DOAJ!